This is my second time using the South Beach Diet as a vegetarian, and I’m feeling so great about it that I thought it’d be fun to share some ideas for success. First of all, don’t let the name fool ya. I know, they all say this, but SB is less a diet and more a way to eat. I think it is about the best, most healthful, practical, delicious and easiest way to go to lose a little or a lot of weight, and to keep it off. If you are not familiar with this system, buy the book and READ it. There’s a bit of a learning curve, but the more info you have, the better. The main take away is: maintaining a MUCH more even blood sugar level. And how this is done is by eating only the right carbs & fats, and in reasonable amounts. IE: goodbye refined, white foods. Second, come on people… it has nothing to do with South Beach! You know me, I’d rather hang out in the Mission District in San Francisco or the East Village in NY, than South Beach in Miami… any day of the week. This is about looking good, yes, but also feeling good (make that great) and being super healthy, nutritionally. Phase 1 of the diet itself is strict and you will eat no carbs except those found in the allowed foods. Yep, it’s tough. The first few days can be really tough. But you’ll get through it and you will lose 8-13 lbs without being hungry. This phase is designed to boost your weight loss, but even more importantly, to put an end to the cravings for blood sugar spikes produced by super high-carb refined foods. It’s only two weeks, and it is worth it. Now, being a vegetarian is an even greater challenge to some extent and there just isn’t much out there on creatively adapting this way of eating. Welcome to this and hopefully many more posts! My lunch today, above, was truly delicious. I’m full, satisfied and not spiking/crashing from carbs. The secret to this one is BAKING some of the vegetables so that they get a little crispy. Any sanctioned Phase 1 veg will do, I used summer squashes (green and yellow) and two different varieties of ‘shrooms, including those weird curly ones, which are DELISH! Preheat oven to 425. Lightly spray baking pan with olive oil spray. (NOTE: the olive oil, a good fat, plays a role here, so don’t eliminate it). Slice veggies thin, about 1/16-1/8 inch. Not too thin or they’ll burn, not too thick or they’ll stay soft. Spread on pan and give a very light spray of olive oil on top of them. Sprinkle with ANY seasonings… even just salt/pepper. But also try bay seasoning, garlic salt, oregano, anything. Bake for 15-20 minutes until brown, flipping once to brown other side. 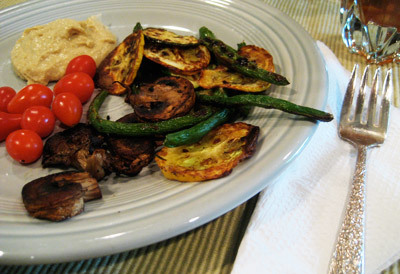 Serve with chilled tomatoes and/or cukes and a nice heap of hummus (I like the Sabra brand best) and enjoy. Remember, make a nice sized serving (which at first will look like it will NEVER fill you up)… eat and wait 15 minutes to see if you really want more. You may not, but if you do, have a little more. 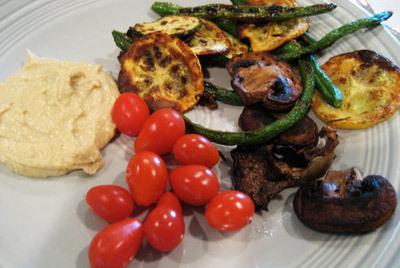 Crispy veggies go soggy in fridge so only make what you plan to eat. NOTE: In Phase 2, toast a half of a whole wheat pita and cut into small pieces to go with your veggies. To drink: sugar free ice tea. Even during my Phase 1, I modify to have dessert twice daily (instead of once as recommended)… and you will know if this is something that helps you be successful or helps you to fail. For me, having a little sweet taste at the end is important and doesn’t make me crave something truly evil. My downfall is more about salty/crunchy than sweet/gooey. You know best on this! Vegetarian purists, this is Jell-O brand and I don’t *think* it’s really veg, sorry! There are veg versions of gelatin, so go for it. 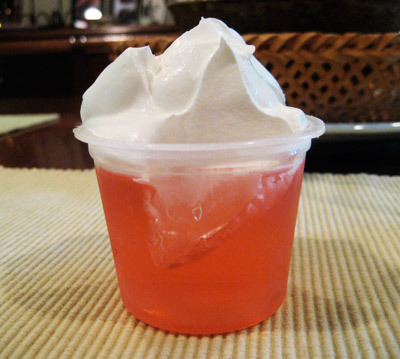 This is the non-fat, sugar free version in kiwi-strawberry. I keep a variety of flavors on hand during Phase 1 since I can’t have fruit. I’ve put some Cool Whip on top, also not allowed in Phase 1 but allowed in Phase 2/3. So, the dessert is really a Phase 2/3 dessert. Cool, sweet, satisfying. A small handful of fresh berries, with or without the Cool Whip, is also a choice for Phase 2 and definitely healthier than the Jell-O thing. But…. NO fruit in Phase 1.